On Friday, Investor’s Business Daily posted their analysis of the recent jobs report. The report was more positive than some recent reports, but there were still a few problems. The alternative measure used by the Department of Labor based on the household survey, showed job growth was even swifter, with a gain of 485,000. Best of all, nearly half a million Americans on net entered the labor force, helping reverse for now a horrid slide in labor market participation. The participation rate now stands at 62.6%, up from 62.4% in September. But we’re still way behind the pre-recession high of 66.2% in 2007. A record 94 million Americans over the age of 16 are not working or looking for work. Average wages were down a notch to $25.24 — bad news on a number of fronts. Real median wages have now been flat for almost a decade. It looks like a lot of those new jobs in December were at McDonald’s or Wal-Mart. About 37,000 came in bars and restaurants. 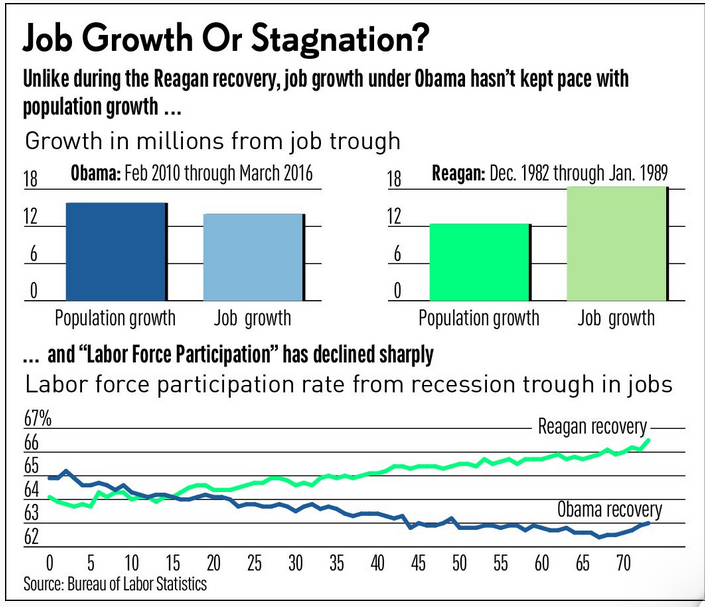 The painful pattern of this recovery is that the jobs gained don’t pay as much as the jobs that have disappeared. Low oil prices are normally good news for the economy, but their relentless decline of late is a symptom of weak global demand from producers. The likelihood of any growth-oriented policy changes in Washington on regulations, taxes, ObamaCare or trade promotion seem remote in the near term. And the Fed is warning of three or four more interest-rate hikes later in the year. Also on Friday, Donald Trump, the Republican front-runner for president, proposed a 45% tariff on Chinese goods and services. It’s hard to be bullish in such an environment. We need some serious changes in economic policies in order to grow the economy. Hopefully the election in November will bring those changes. Breitbart.com posted an article today about the June jobs report. 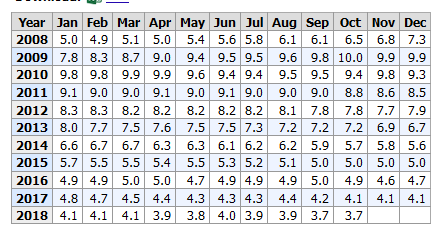 Most of the mainstream media is trumpeting the fact that 237,000 jobs were created in June. That is good, but what they fail to mention is that the civilian labor force shrank by 432,000. The labor force participation rate also decreased 0.3 percent from last month to 62.6 percent. The country has not seen a labor force participation rate that low since October 1977 when the participation rate was 62.4 percent. The BLS reports that the civilian labor force also shrank by 432,000 in June, from 157,469,000 in May to 157,037,000 in June. While people dropped out of the workforce the BLS (Bureau of Labor Statistics) highlighted that the unemployment rate declined to 5.3 percent and payroll jobs increased by 223,000. The number of people who dropped out of the labor force was higher than the number of jobs created. That is not a good thing.